Melbourne International Comedy Festival Posters Number 2. 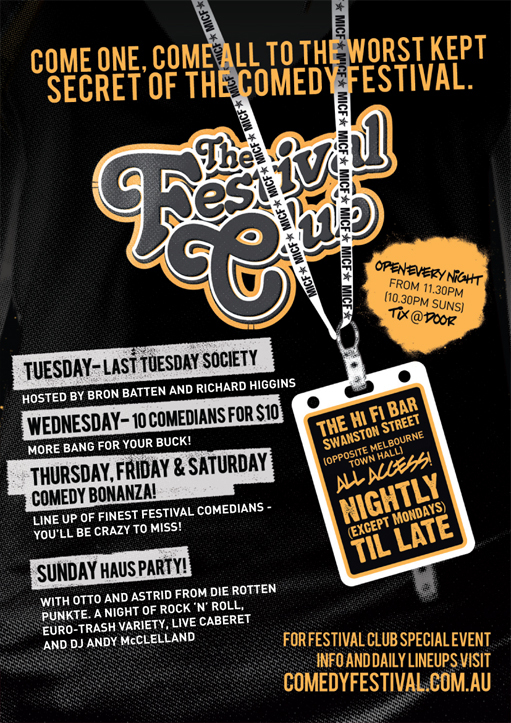 The second in our series of Melbourne International Comedy Festival posters is the Festival Club, a random night of spontaneous comedy. Apparently. 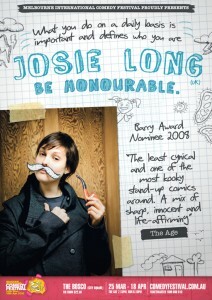 The first of our posters is that of the great Josie Long! For the last five months we’ve been creating, editing, pdf-ing, editing, editing, creating, pdf-ing and editing A3 posters, A6 flyers and print ads for the talented comedians for this years MICF. The team that contributed work for these posters includes: Andy Isaac, Andrew Gauld, Rob Davies and Garth Jones, with art direction by Andrew Gauld. We hope you enjoy the work to come! Why, hello there. Welcome to the 10Fold blog. You’ll find all sorts of goodies, news and great design work here. 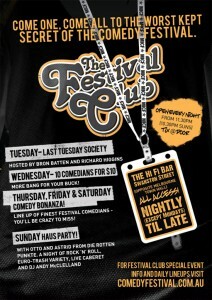 First up will be a heap of the great Melbourne Comedy Festival posters we’ve been working on the last few months.